Chris, Hank, and Bob are watching Spider-Man’s big MCU solo film today and you know they’re all going to have a lot to say about it. Join us LIVE as we record our reactions for next week’s Laser Time at 3PM PST. Join us in the chat to talk all about Peter Parker and his amazing friends! You didn’t think the Laser Time comic nerds could avoid talking about the new Spider-Man movie, could they? They’re seeing the film today and then coming straight to YouTube to discuss our reactions! Stay tuned to this very page where we’ll embed the link to the stream at 3PM Pacific Time! (Or subscribe to our YouTube page and be alerted every time we start streaming! Looking for more Spidey chat in the meantime? Check out our new and ongoing deconstruction of every card in the second Marvel series from 1991! The Simpsons Movie – Monday Night Movie 7/10! Spider-Man Homecoming Where to begin? Thanks for 0 origin story & thanks for not actually being Iron Man 3.5. 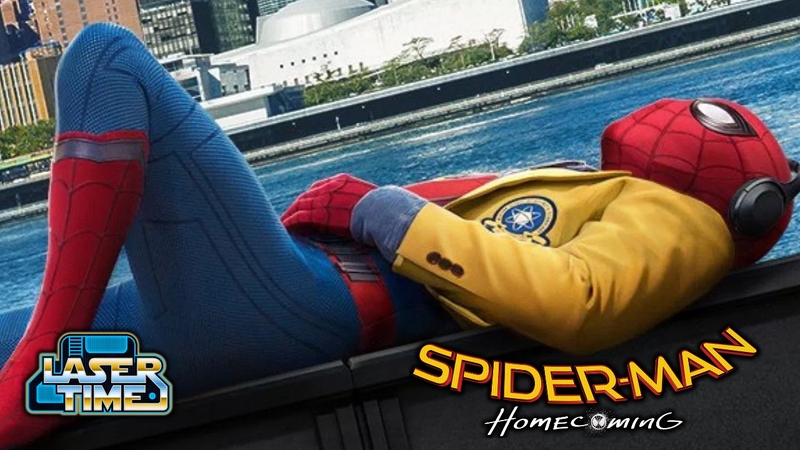 Homecoming hops right into an established world of Avengers/Parker, seamlessly blending the two and thus removing gaudy, gross exposition. There are still some moments that were a tad forced like the “MJ” line, and a couple others, but otherwise it’s solid storytelling.here’s always a hook pulling you, always the story progressing. Although I personally felt maybe 15-20 mins could’ve been cut, it’s minor. I absolutely ADORE the Vulture’s allegorical name and story. He’s literally a guy building up from the scraps of the bottom of the world! Holland/Downey’s dialogue is tops, as it was in Civil War, and Holland will be a fine Spider-Man. His friends were aces too. Personal preference: I would have liked Buress & Glover to have larger roles, but they did their jobs perfectly. This is a Spider-Man I want to see more of, want to explore more of, and eagerly await more of. It’s lust, not obligation for me. Thank you Sony for swallowing your STUPID pride & allowing competent teams to create another terrific Marvel film that is one of their best. I don’t need to tell you you should see it; you’ e made up your mind already I imagine. I do think you wouldn’t regret seeing it though. Spider-Man Homecoming might be my favorite superhero movie this year. Naturally that’s fraught with a gut reaction, and stiff competition. I liked it, didn’t love it though. There’s nothing particularly wrong with it, but still felt like there was something missing. Like, I’m glad they didn’t go into his origins at all, but there didn’t seem to be a really strong emotional core to it. Likewise, the action was fine, but never outstanding, and often times hard to appreciate due to the camera having Parkinson’s level of shaking in some moments. After that line in Civil War he sure did have a lot of Star Wars stuff, an X-wing hanging in his room, building a lego Death Star!